From a 20,000 foot view, Exit Planning is just GOOD BUSINESS STRATEGY. One of the first things that Exit Planning requires is a shifting of focus on the part of a business owner and key employees. The focus must shift from profit/revenue mindset to a business value mindset. But doesn’t more profit = more business value? Absolutely,. But that isn’t the only factor affecting the value of your business. You should know that there are MANY non-revenue factors that greatly affect what your business is worth. Example: Customer Concentration. Okay, but I don’t think I am ready to exit my business. It’s wise for all business owners to adopt – or at least understand – a mindset focused on business value. Offers can come at any time, and you don’t want to be caught with your pants down when it happens. While it’s a smart for all owners, Exit Planning is extremely smart for a business owner who thinks there is even the slightest possibility for an Exit in the next 5 years. Exit Planning is becoming a a trendy topic among many fields of advisors due to the wave of baby boomers that are approaching retirement age. You should understand that these advisors can often play a critical role in a piece of your Exit Plan, but their services alone are not Exit Planning. Very few firms have taken the time to wrap their arms around the monster that is Exit Planning and develop complete programs for departing owners. 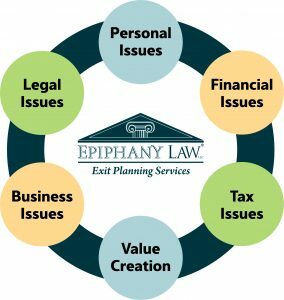 So I take it Epiphany Law has a complete program? Our process starts with a thorough assessment of where you – and your business – are at. We call it our Benchmarking stage. This includes “hard” assessments like business valuations and personal financial plans. It also includes “soft” assessments like an emotional readiness evaluation to help you prepare for the “life struggles” commonly faced by retiring owners and their families. So you’re just assessing me and leaving me to fix problems on my own? No. Once we understand the issues that you and your business are facing, we roll you through a series of “modules” designed to address those areas. Modules generally fall into one or more of these categories: Remove Risk, Improve Efficiency, and Strategic Growth. What am I supposed to get out of this? If you are really ambitious, you can start the process of obtaining a business valuation here.